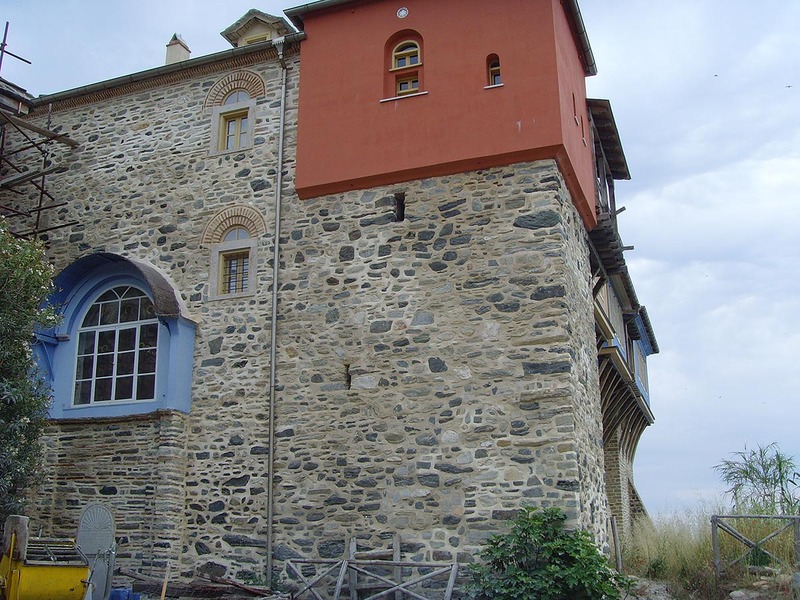 The Pantocratoros Monastery celebrates on the 6th of August the Transfiguration of Christ. It was founded by the great stratopedarch Alexios and his brother Ioannis Primikirios the Great. 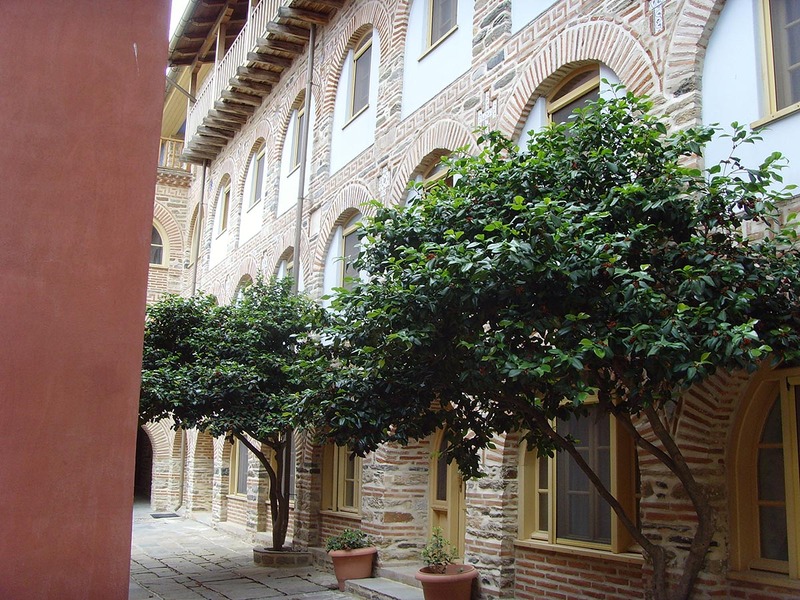 A document signed by the Patriarch of Constantinople Kallistos in 1357 confirms the establishment of the Monastery. The Pantocratoros Monastery is locatedon a rock in an altitude of 40-50 meters on the east coast of the peninsula of Athos. 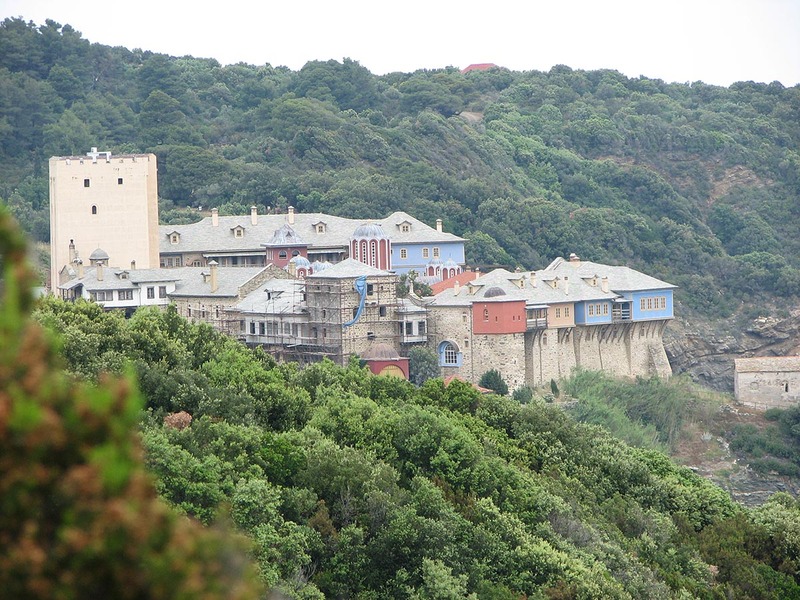 It is a 3.5 hours walk on foot from Karies and it is the seventh in the hierarchy of monasteries in Mount Athos. The Emperor Ioannis IV Paleologos granted substantial sums to the founders of the Monastery. There is an inscription which mentions the case of a third owner before 1536, the Great Logothete of Hungary-Wallachia Stanlon, but it was removed in 1847 from the narthex of the Katholikon when the building underwent conversions. 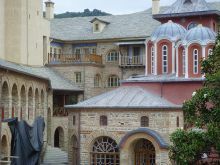 The Monastery was destroyed by fire in 1390 and it was rebuilt with the help of the owners, emperor Manuel II Paleologos and patriarch Anthonios IV. 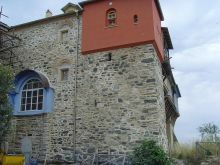 During the same time, smaller monasteries such as those of Fakinou, Falakrou, Soriti and Agiou Demetriou came to the juristiction of the Pantocratoros Monastery. 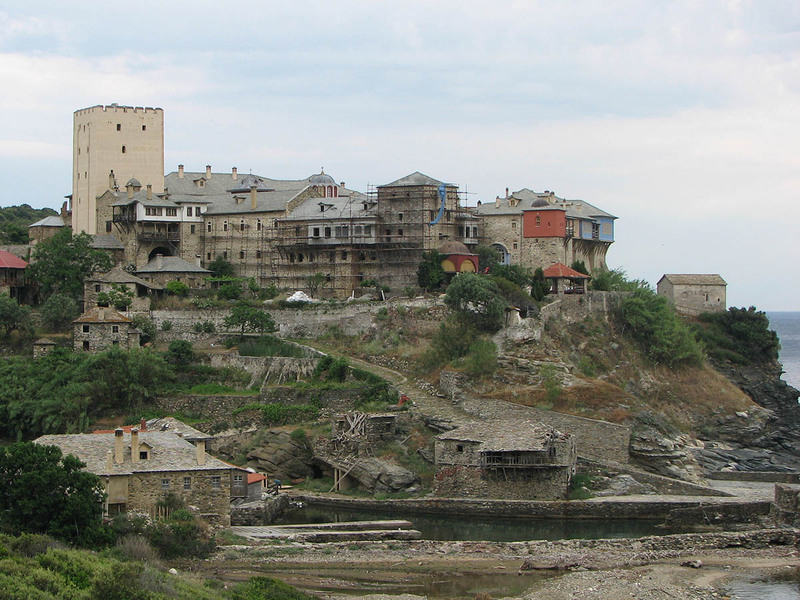 It flourished during the 16th century since it had the direct support of Wallachian rulers. 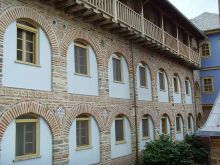 Among the most important benefactors of the Monastery was the Greek Ioannis Mavrokordatos from Fanari in the 18th century. 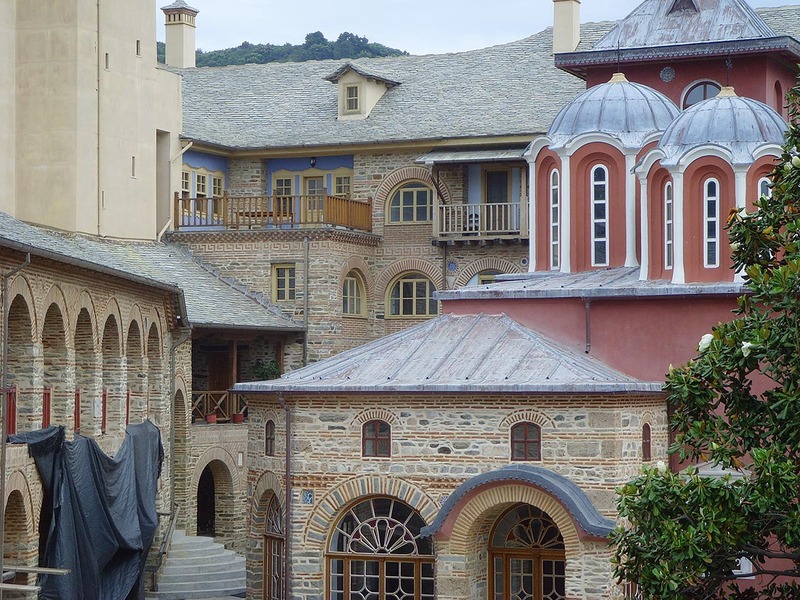 The monastery was destroyed by fire in 1773, but it was rebuilt with the help of the monk Cyrilos, and again after the two World Wars where buildings which were burned were rebuilt by the Reconstruction Service. The Katholikon of the Monastery is honored in the name of the Transfiguration of Christ on the 6th of August. The murals on the walls were painted in 1538 by Matthaios Ioannis from Naoussa. There are of course segments of older frescoes that have been preserved until today. 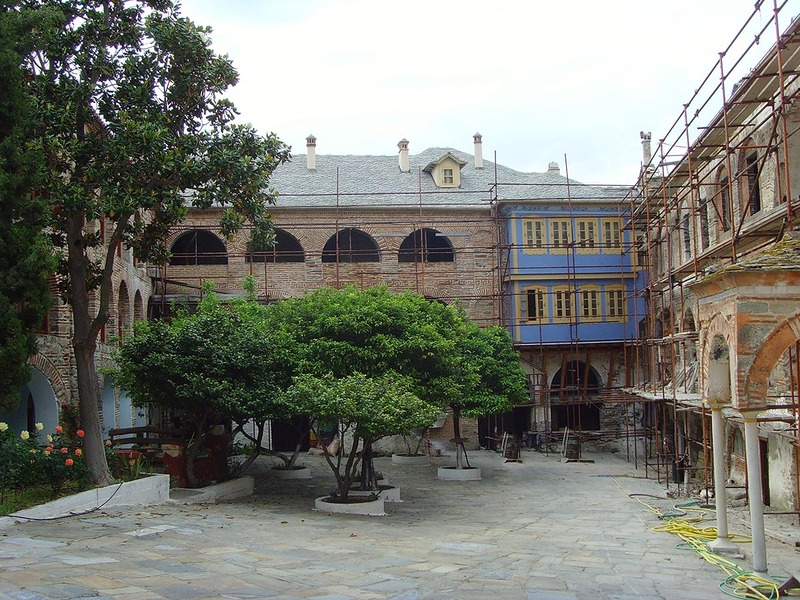 Apart from the graves of the owners of the monastery in the Katholikon there is also an iconostasis dating back to the period of 1622-1640. The Prothesis opposite the Katholikon was built in 1741 and it is incorporated into the wing after the cells of the monks and it was decorated with murals in 1749. The building was extended in 1866. 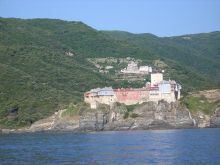 The Monastery has 16 Cells and 30 Huts. The library contains 3,500 printed books, 2 scrolls, 317 manuscripts of which 68 are codes in parchment from the 11th and 14th century and almost 350 codes. In the sacristy there are pieces of the shield of Agios Merkourios, miraculous pictures, pieces of the Holy Wood, filigreed gold curtains, sacred relics as the right leg of Agios Andreas and the relics of Agios Kosmas and Agios Damianos. The picture that is being commemorated the most is that of Panagia Gerontissa. 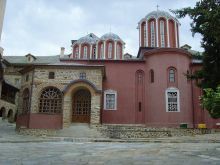 At the Monastery guests should visit, in the Katholikon, the full body picture of Panagia Gerontissa, and also in the tower of the Monastery the sacristy with its famous pictures of the 14th century. It took its name from a miracle during the preparation of the death of an elderly priest. The story is as follows: God revealed the day of his death to a sick pious abbot. He wanted before he died to receive the Holy Communion. Therefore he requested from the monk to hurry and give him Holy Communion. He, however, was delayed and the old man risked dying without having received Holy Communion. Then from the picture of the Virgin Mary an angry voice was heard asking the monk why he was taking so long and why he did not comply with the request of the old man. Of course the monk complied and shaking as a leaf he performed his duty. Since then the picture was named 'Gerontissa' (Old Woman), because she supported the request of the old man.